Using a climate model adapted to the special conditions on Mars, researchers believe they can reliably predict snowstorms on Mars far in advance, helping future missions choose better routes that avoid heavy snowfall. Snowstorms lashing down at the northern hemisphere of Mars during the icy cold winters may be predicted several weeks in advance, say researchers from the Tohoku University in Sendai (Japan) and the Max Planck Institute for Solar System Research (MPS) in Katlenburg-Lindau (Germany) in their newest publication. For the first time, the scientists’ calculations show a connection between these snowfalls and a special Martian weather phenomenon: fluctuations of pressure, temperature, wind speeds, and directions that in the northern hemisphere propagate in a wave-like manner and occur very regularly. For missions to the red planet exploring this region with rovers, such weather forecasts would offer the possibility of choosing a route that avoids heavy snow storms. The Martian polar regions are an icy cold world. Similar to those on Earth they are covered by cohesive ice caps. In winter, when the temperatures drop below -128 degrees Celsius, this layer of ice is mainly supplied by frozen carbon dioxide from the atmosphere. The ice caps then cover a region reaching south to about 70 degrees northern latitude. Only in the comparably warm Martian summer the carbon dioxide sublimates revealing the planet’s eternal ice: a considerably smaller cap of frozen water. “Mars’ seasonal ice has two different origins“, says Dr. Paul Hartogh from the MPS. “A part of the carbon dioxide from the atmosphere condensates directly on the surface – similar to the way a layer of frost forms on Earth in cold, clear weather. Another part freezes in the atmosphere”, he adds. The tiny ice crystals accumulate into clouds and fall to the ground as snow. In the new study, the researchers were now for the first time able to establish a connection between the occurrence of such ice clouds and a wave-like weather phenomenon characterized by a periodic change of pressure, temperature, wind speed, and -direction. “This weather phenomenon on Mars is unique”, says Dr. Alexander Medvedev from the MPS. Indeed, these so-called planetary waves can also be found in Earth’s meteorology. However, not only are the oscillations in pressure and temperature in the lower atmosphere much weaker here. They also occur much less regularly and their wave characteristics are much less pronounced. “In the Martian northern hemisphere between fall and spring these waves can be found with astonishing reliability”, the physicist adds. They propagate eastward with a uniform period of five to six days. Close to the surface, waves with higher frequencies can also be observed. Due to the planetary waves the temperatures in the Martian atmosphere regularly oscillate around values notably below -128 degrees Celsius. This is the temperature at which carbon dioxide gas freezes. The scientists’ calculations now show, that everywhere where the temperatures sink accordingly, tiny ice crystals are formed and accumulate into ice clouds. “These clouds can be found north of 70 degrees northern latitude in all layers of the atmosphere up to a height of 40 kilometers“, says Hartogh. The ice crystals that form below a height of 20 kilometers fall to the surface as snow. “In order for such snowfalls to occur, the periodic temperature changes must be similar in all layers of the atmosphere”, explains Medvedev. This is given in heights below 20 kilometers. In all other cases, the snow crystals encounter warmer air layers on their way down – and sublimate. Especially in a region in the northern hemisphere between 30 degrees western longitude and 60 degrees eastern longitude, these requirements are well fulfilled. Images taken by space telescopes and space probes show, that in this region the ice cap of frozen carbon dioxide reaches especially far to the south. The researchers’ calculations suggest that all in all approximately half of the seasonal ice falls to the ground as snow. For their simulations, Dr. Takeshi Kuroda from the Tohoku University and his colleagues from the MPS used an established climate model that they adapted to the special conditions on Mars. “The calculations need to take into account the large amounts of dust in the Martian atmosphere“, says Kuroda, who worked at the MPS until 2009 where he also received his PhD. In addition, the Martian atmosphere consists of more than 95 percent of carbon dioxide. 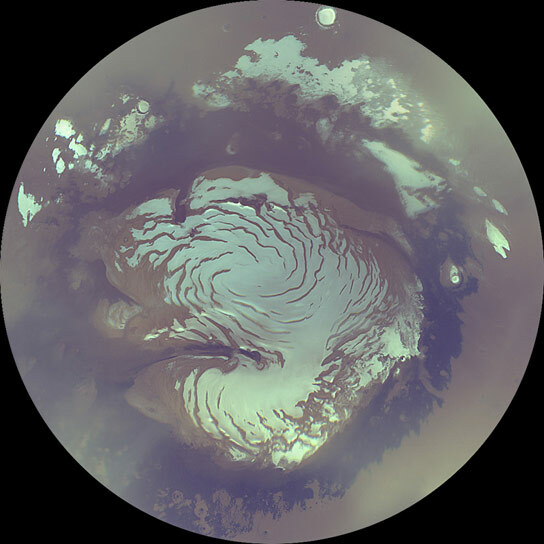 The calculated temperatures and ice crystal densities are in good accordance with measured data obtained by NASA’s Mars Reconnaissance Orbiter. In the researchers’ opinion, the new results could help to reliably predict snowstorms on Mars. “Everyone knows from experience that on Earth reliable weather forecasts are only possible for a time span of five to seven days at most”, says Medvedev. “It is simply impossible to calculate whether or not it will snow somewhere on Earth 20 or 40 days in advance.” On Mars this is different. The simulations show that in certain regions on Mars snow falls can be predicted far in advance. “For missions to Mars aiming to explore these regions with rovers this is valuable information”, says Hartogh. The rovers’ routes could be planned to avoid heavy snow storms. Be the first to comment on "Researchers Believe They Can Reliably Predict Snowstorms on Mars"